This week on Fear the Walking Dead, we were all over the place. With only 3 episodes left we are winding down to the end. We got to see all our survivors separately. Then miraculously finding one another like always. The episode jumped all over, but I’ll break it down per group. First we see John, and Strand. They are Stranded on a small island surrounded by water. The water has risen quiet high because of the storm. John is making a raft to get across and find the others, while Strand is, well Strand. After trying the raft out alone, because Strand was staying behind, John got a big surprise in the form of a huge gator. This thing was massive! Jumping back to shore John loses hope of getting across, and an I told you so from Strand. While cutting branches John sees a truck with a bed cover and enlists Strand to get it, pulling the your people shot me card. Once up there, Strand seen a bottle of liquor on the floor, but also a zombie in the driver’s seat. The truck was on a horrid angle. Hopping on the side of truck Strand leans in for the bottle and down goes the truck, flipping down the hill it was on top of. Luckily the zombie gets a branch to the head, Strand gets his drink, and John gets his Truck bed cover. Rigging the battery to the car horn, John hopes to bring the dead to them, keeping the Gator occupied whilst they slip by in the raft. Convincing Strand to join him, they start-up the horn and take off. Everything is working great until the horn dies, the dead turn around, and the gator starts attacking their makeshift raft, causing a leak. Panicking John shoots off his gun to call the dead back and they swim back to where they started, both defeated. Lucy is looking for Charlie and spots a library. Knowing she loves books she checks there to no avail. Waking outside, she finds a gravely injured man in a car. While trying to help him, they realize the car crushing him is what is keeping him alive. He tells Lucy all he wants is one last beer, so she sets off to find one. Looking everywhere, she has no luck and eventually radios in to tell him she was sorry. He tells her she will help people on her journey, even though she couldn’t help him. That’s when she finds a box left by Morgan and co, with a single beer. She also grabs an ice pack out of a first aid kit and puts them both in her pack, heading back to the old man. He is so happy to have his last beer he gives her some journals. Turns out the man is the Truck driver that owned the truck Morgan is in. On the box was a radio channel to call for when of needing help. She calls and it’s Morgan. Morgan and Co are still looking for the elusive Quinn, when they find the crazy ladies old walker. Then get a call from her on the radio. She tells them to stop leaving supplies, because it is making people weak, then she has to make them strong again by killing them. I don’t know either, she is insane, clearly. She tells them that Quinn is dead, so they pack up and head off to find the others, still leaving things in boxes. They are looking for John, Strand, Lucy, Alicia, And Charlie. Eventually while driving they get that call from Lucy, who they find and pick up, and Alicia and Charlie, who they don’t make it too. The reason being is miss psycho in Al’s van found them and shot up the truck, ending the episode. 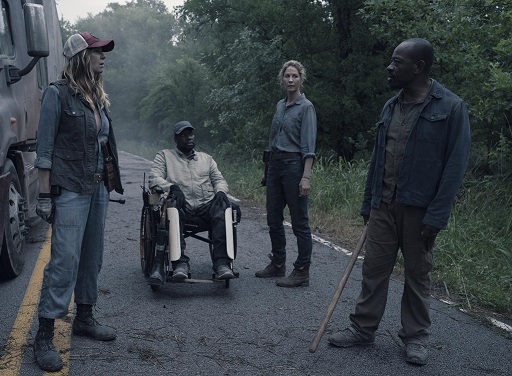 So we only see Alicia and Charlie very briefly in this episode at the end, Strand and John are still not even close to being found, and the truck has been shot up by psychopath. Can’t wait for next week! This episode was entertaining, but a little slow. I definitely enjoyed watching non the less. Previous Article← Keystone Comic Con Is Next Week!